I’m in the process of wrapping up Bewhiskered for 2010, which includes making a donation to PAWS Atlanta. I pledge 10% of profits each year to an animal charity, and this year’s recipient was PAWS Atlanta, a no kill shelter in the Atlanta, Georgia area. I didn’t actually make a profit this year (nor did I really expect to) so I sent in a donation of $25. For 2011, I have decided to donate to Pit Bull Rescue Central. Tiger at 13 years old. 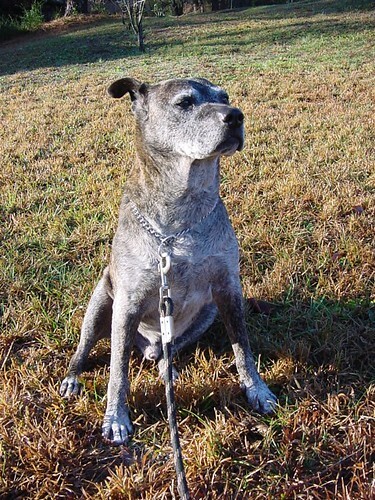 This donation will be made in memory of Tiger, a pit bull who shared my life for 17 years. I lost him in July of 2010 and he is sorely missed. Pit Bull Rescue Central works to educate people about the breed as well as being active in rescue. Pit bulls are wonderful, loving animals that deserve the chance to have a good life. If you’re unfamiliar with the breed outside the media, rumors and stereotypes, I hope you’ll educate yourself by visiting PBRC’s breed info section. If you’re already acquainted with these fantastic dogs, I hope you’ll join me in donating to PBRC. What a wonderful thing you’re doing! Animals do deserve our love and caring! Thanks Pili. I’ve always loved animals, and I’m glad I can do a (very small) part to help them.